You want me to sit? Training a Siberian Husky is a challenge. They are extremely intelligent and stubborn, which can be difficult when training. They might talk back when you ask them to sit and soon you will find yourself having a conversation with your Siberian about why he or she should sit for you. Or they might stare directly at you in understanding of the command and decide they just don't feel like listening. Because of their independent spirit, training must be handled with consistency and patience. A Siberian Husky owner really should come armed with both a lot of good reading material and a good sense of humor to be able to handle their antics. 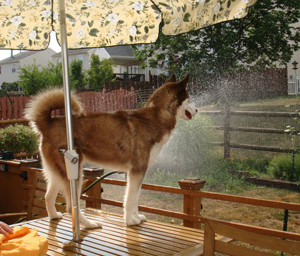 A successful Siberian Husky owner will tell you that training involves lots of positive training. You ask, "What is positive training?" Positive reinforcement training is a method by which a dog is praised for performing the desired task or behavior. Generally, this praise is done by voice, clicker, or treat. It is most assuredly the best method to use when training your Siberian. As a working dog, they like to learn and enjoy having a job to do. The dog is happy learning something new, and the owner is happy to be successfully teaching. It is a positive experience for all and a great way to bond with your dog. As with all training, it is important to be patient and consistent. Training should be done for no more than 10 minutes at a time, as your dog may become bored. If you decide to devote 30 minutes a day to training, you will get much more from three 10 minute sessions than one 30 minute session. 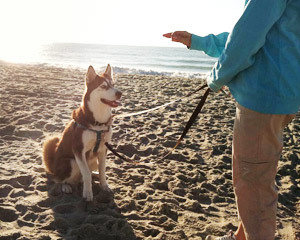 Siberians are very intelligent dogs, and as such, are prone to become bored during training. Therefore, it is good to continually teach them new things throughout their lives. As they learn new things, your relationship will continue to grow. Tails of the Tundra is very fortunate to have several volunteers who are familiar with positive reinforcement training, basic obedience and manners training, and dog behavior problem solving. If you find yourself needing any advice or help on how to proceed, feel free to email us; one of our volunteers would be happy to lend a helping paw. How do I get closer to the sprinkler?